Saturated fat and cholesterol are not deadly. In fact, they’re good for you! It’s the carbohydrates — especially wheat and sugar — that are “your brain’s silent killers,” according to the new book, Grain Brain, by the board-certified neurologist, David Perlmutter, MD. Scientific research is reaching a tipping point and the nutrition paradigm is shifting. Most likely it will take years for the food and pharmaceutical industries to catch up. They have too much of a vested interest in the old low-fat/high-carb paradigm. And the big-name health and nutrition organizations (including the U.S. government which has a food policy that hews to the low-fat/high-carb theme) are slow to change. But that doesn’t mean you have to be stuck in a rut! 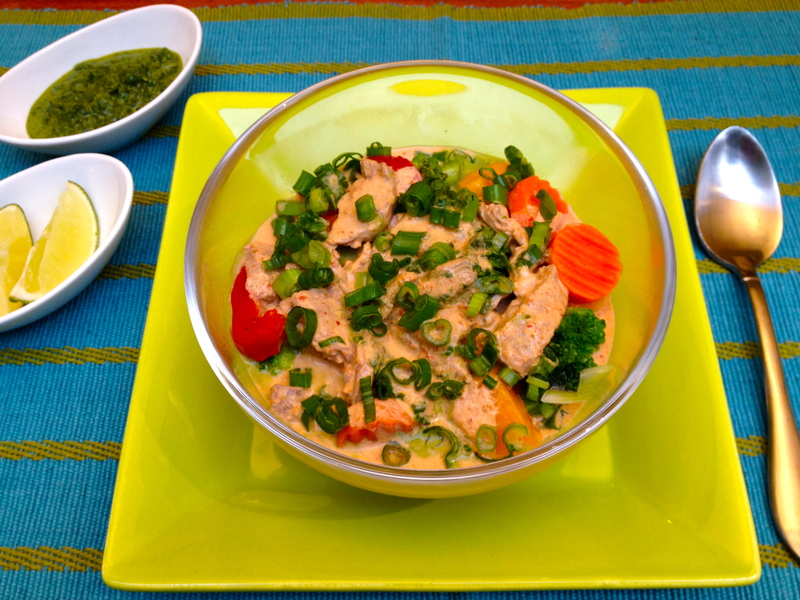 If you are ready to start cooking the healthy high-fat/low-carb way, here’s a delicious and easy-to-whip-up Thai curry — just don’t serve it with rice! Add the cilantro and basil (including the stems) and about 1/2 cup of the coconut milk to a food processor and process to the consistency of a fresh herb sauce (pesto); set aside. Add one of the 13.5-ounce cans of coconut milk and the curry paste to a large pan. (A 14-inch wok works great.) Stir over medium-high heat until the mixture starts to boil. Add the thinly sliced beef and all the rest of the coconut milk to the pan. Stir and until the mixture starts to simmer. Reduce the heat and simmer gently for about 3 minutes or until the beef is cooked. Place a large serving of the lightly cooked vegetables into each individual bowl. Ladle the beef curry on top of the vegetables. Pass the reserved cilantro-basil sauce, sliced scallions, lime wedges, and fish sauce so each person can customize the curry to their own taste. Note: This recipe makes a lot of curry! You will get quite a few meals out of it — unless you have a large family with teenage boys. Thai Red Curry Paste – Thai Kitchen (brand) red curry paste is available in most stores. If you have access to an Asian market, you can probably find the Maseri and Mae Ploy brands of Thai curry paste as well as other brands – and in my experience at these stores the price is a lot better than on Amazon. Frozen organic vegetables – I really like Whole Foods’ organic frozen veggies. For this recipe their broccoli florets, butternut squash, and Mediterranean blend work great! Of course, if you have time, you can start with fresh vegetables. Fish Sauce – I love the Red Boat Fish Sauce made from nothing but anchovies and sea salt. Just a few drops of this umami-rich sauce go a long way! Refrigerate after opening. Another delicious recipe to follow!